In this procedure, commonly known as the LapBand®, a silicone elastomer band is placed around the upper part of the stomach to create a small stomach pouch which can hold only a small amount of food. The lower, larger part of the stomach is below the band. These two parts are connected by a small outlet created by the band. Food will pass through the outlet (“stoma” in medical terms) from the upper stomach pouch to the lower part more slowly, and one will feel full longer. The diameter of the band outlet is adjustable to meet individual needs, which can change as one loses weight. Identifying patients who will not "eat through" the operation is difficult. Although restrictive operations lead to weight loss in almost all patients, they are less successful than malabsorptive operations in achieving substantial, long-term weight loss. Successful results depend on the patient’s willingness to adopt a long-term plan of healthy eating and regular physical activity. 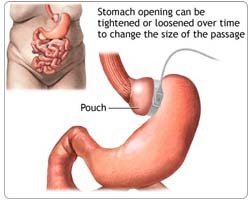 Adjustable Gastric Banding Surgery India, Cost Adjustable Gastric Banding Surgery ,Adjustable Gastric Banding Surgery India, Low Cost Adjustable Gastric Banding Surgery Delhi India, Adjustable Gastric Banding Surgery Hospital Delhi, Adjustable Gastric Banding Surgery Mumbai Hospital, Cost Adjustable Gastric Banding Surgery Mumbai, Delhi-India, Low Cost Adjustable Gastric Banding Surgery Hospital, Affordable Adjustable Gastric Banding Surgery Hospital Mumbai, Delhi, Cost Adjustable Gastric Banding Surgery Hospital Delhi.